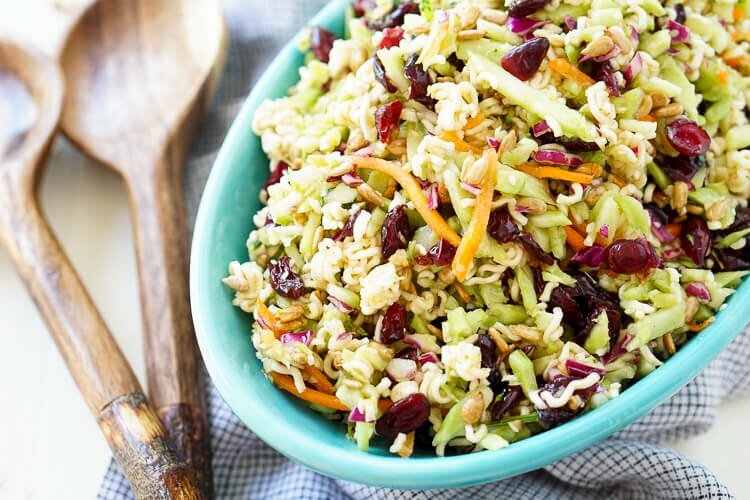 This Crunchy Ramen Noodle Salad is a light and delicious addition to your summer gatherings. No cooking required and it’s ready in just 10 minutes! 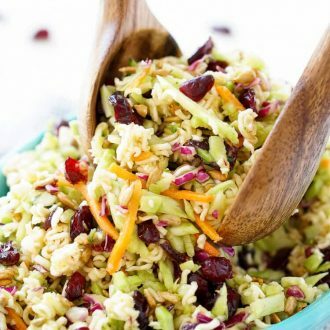 Ramen Noodle Salad is the perfect quick side dish for summer! It’s addictively delicious and everyone will want this recipe! 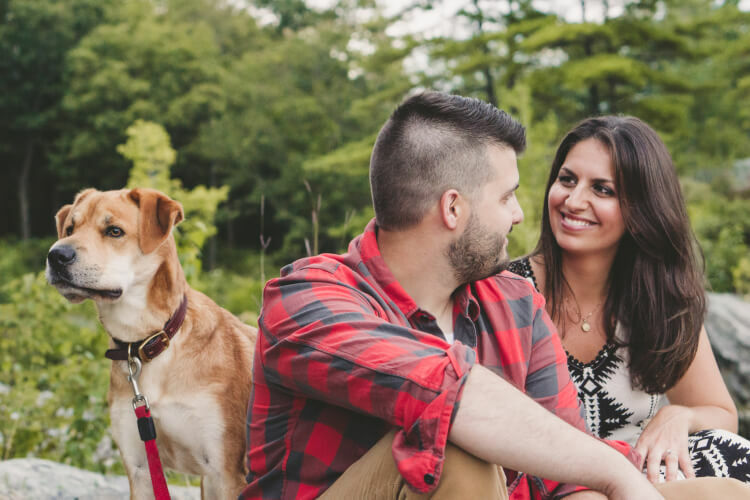 Last night I went to Southern Maine to do the engagement photos of two of our closest friends. We’ve been friends with Rob for about eight years now, My husband and I met him at Target when we were working there in the summer of 2008. I was sitting in the break room one day and heard him talking about comic books and I turned to him and said, “Hey, you and my boyfriend should be friends”, and the rest is history. Even though Rob and I are great friends, we’d been waiting for him to find that perfect someone. And after years of waiting, we got Karen, and couldn’t be happier; she totally passes “The Front Porch Test“. In fact, you guys might recognize Karen since she contributes to this site with fun fashion and pet related stories. 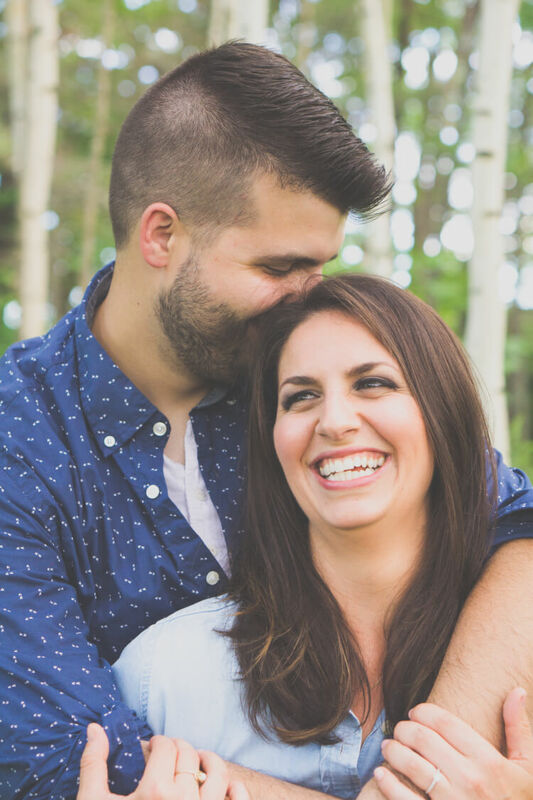 Two years ago, Rob and Karen left Maine and moved to North Carolina to try out life in the South, but they recently moved back home. So yesterday was a reunion and a celebration! We really, really missed them. Seriously, aren’t these two just adorable? Nothing makes me happier than seeing my friends THIS happy! Afterward, we ordered pizza and had a couple drinks and caught up, it was just what I needed after a crazy and stressful few weeks months years. When we left and said we’d see them in September, it made me realize that that was only a couple weeks away and I still had a summer salad recipe I hadn’t yet shared with you! Buy My Favorite Salad Spoons Now! 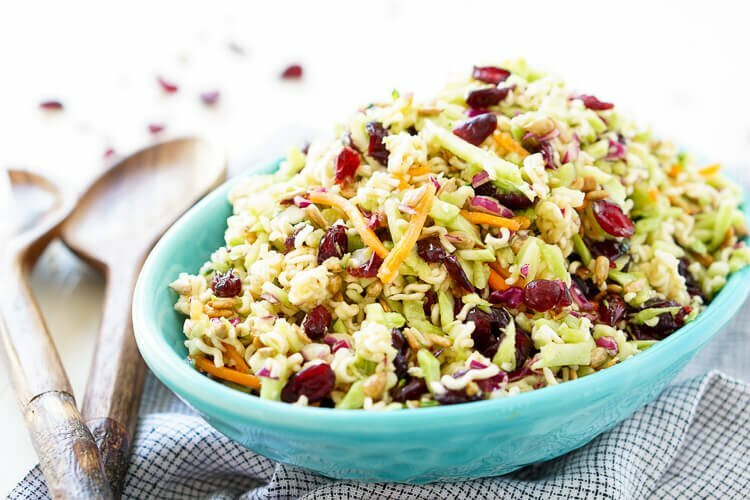 This Crunch Ramen Noodle Salad recipe was shared with me by a friend a couple weeks ago and it is so easy and fast to whip up. The best part is that you don’t even have to cook the noodles, they’ll soften up after a few minutes thanks to the oil and vinegar! 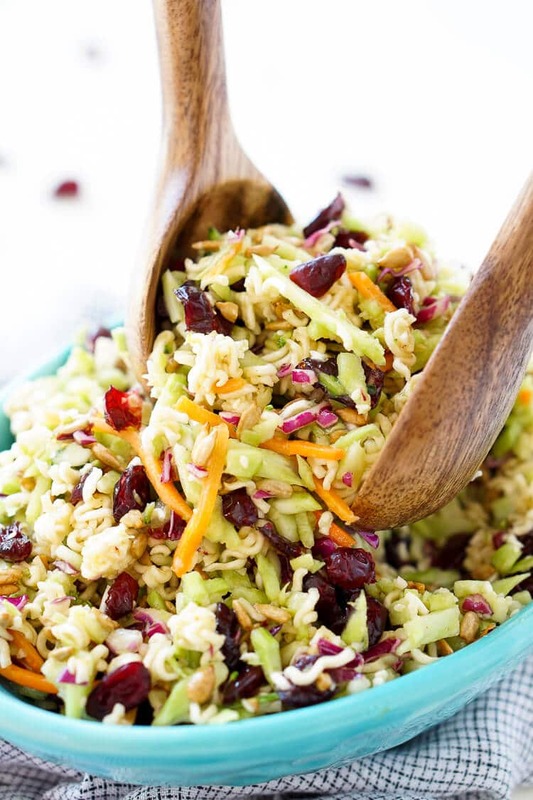 It’s loaded up with broccoli slaw, craisins, sunflower seeds, and sesame seeds. It makes for a really great side dish at a summer party or as a light lunch, add chicken too if you want! This recipe is super easy to make, you really just throw all of the ingredients together in a large bowl and let it sit for a few minutes. The longer the salad sits, the better the flavor! Pin this Ramen Noodle Salad for Later! Watch How to Make this Salad in the Video Below! This Crunchy Ramen Noodle Salad is a light and delicious addition to your summer gatherings. No cooking required and it's ready in just 10 minutes! Combine all ingredients, including the seasoning packets from the ramen, in a large bowl and mix until evenly coated. 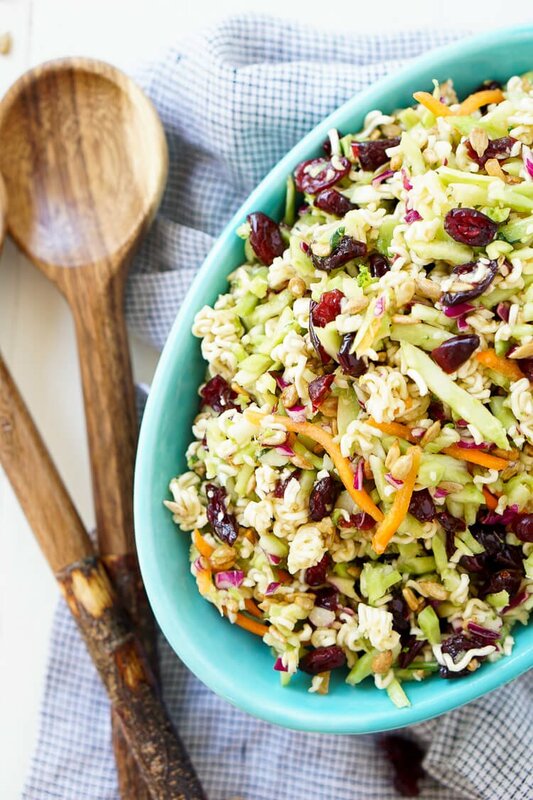 Omgosh, I could go for a giant bowl of this salad for lunch today. In fact I would completely devour it in one setting. It’s just my kind of meal. Pinning now! Can I substitute the Vegetable Ramen…we have Vegans in our family.